This summer at Nucksaid, I decided to make it all about my favourite part of Vancouver Canucks hockey: the FANS. The trend continues and will keep going all summer long! If you or anyone else you may know would like to be featured and share YOUR True Blue story, there is plenty of room for MORE of you! 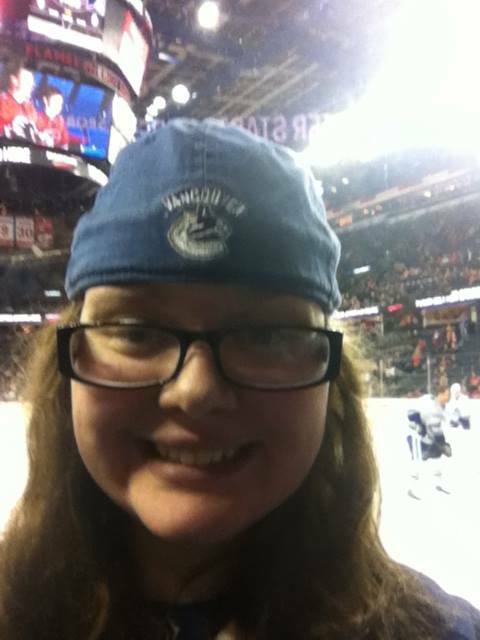 I will be featuring the fan profiles up until the eve of the Canucks first regular season game. All you have to do is send me an e-mail to nucksaid@gmail.com with the subject line: TRUE BLUE and I will send you all the details you need! Are you ready to meet some more Canuckleheads? “I became a fan in a pretty weird way. Growing up in a Detroit Red Wings household, it was ALWAYS, Red Wings or die and that was weird in Ontario but never the less I did. For a while I stopped watching hockey, and in 2009 I started getting back into watching it and and really getting into it. In the playoffs, it was game six of the second round: Chicago vs. Vancouver. It was late for me, so I was told to go to bed, BUT it was a really exciting game with all the goals being scored. I couldn’t sleep, so I kept watching in my room and by game the Canucks lost 7-5 and I felt so down about the final outcome. Ever since that game, I have done my best to keep watching the Canucks whenever I can, watching highlights and looking things up about the team, etc. My favourite Canuck? Considering that I never really fully started watching the Canucks until a few years ago, one of the most exciting people to watch in a Canucks uniform for me, was Rick Rypien. Holy cow, watching him fight was amazing, it was truly great. My all-time favourite Canuck moment would have to be Alex Burrows’ OT goal in game 7 of the 2011 playoffs against Chicago. Nothing else can compare to finally slaying the dragon! My favourite thing about hockey has to be the way it gets you so into the game, how it can you on top of the world one moment and in the very next it can feel like it just took everything away from you and you have nothing. My least favourite thing about hockey can be tied into that as well..that’s the worst thing- watching your team get beaten in the playoffs in such a bad way, it just leaves a sting in you for a long time. As for pre-game or game day rituals, I have only one. Once I wake up on a game day, the FIRST thing I do, is put on the jersey. I can’t go without it on a game day, it’s almost like a good luck factor. First, I still miss seeing Rick Rypien lace ’em up with the Canucks. Every time Rypien stepped on the ice, you knew he was going to play with his whole heart and every fight he took on had the fans on their feet. He left this world far, far too soon. Second, finally slaying that dragon after facing those pesky (and extremely talented) Chicago Blackhawks for a third straight year will always be one of my absolute favourite moments in Vancouver Canucks history! The rivalry that these two teams developed over those 19 games(3 playoff series) was so wonderfully intense, exhilarating, exasperating, exciting and keep you on the edge of your seat hockey until the final buzzer each and every game. Next up, let me introduce you to Terry Niles and check out that completely Canucked out cubicle?! (Pictures provided by Terry). 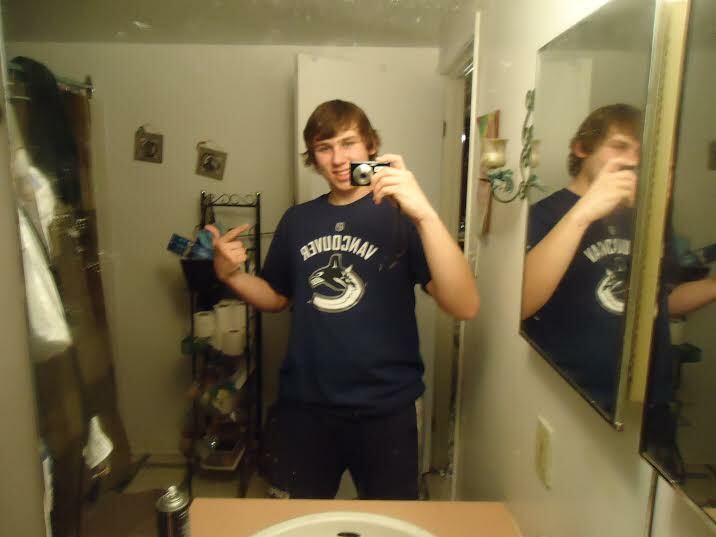 “I have been a Vancouver Canucks fan since the beginning! I lived in Vancouver at the time and I remember going to Canucks games at the Pacific Coliseum! My all-time favourite Canuck is Tiger Williams. 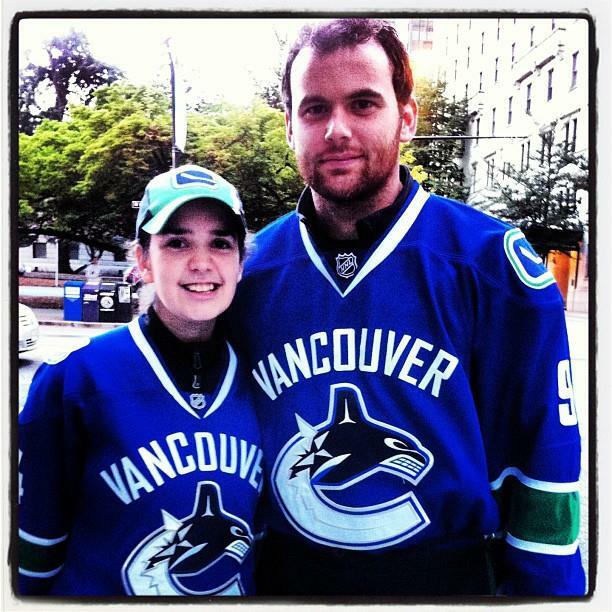 I am partial to scrappy guys, so I am currently a fan of Zack Kassian! My all-time favourite Canucks moment was the 2011 playoff run and going all the way to game seven of the Stanley Cup Finals vs. the Boston Bruins. It wasn’t the outcome we wanted, but it was an impressive run and I remember getting more and more excited as we advanced through EACH round! My pre-game ritual is to wear my Manny Malhotra T-shirt, has to be that one OR we’ll lose! 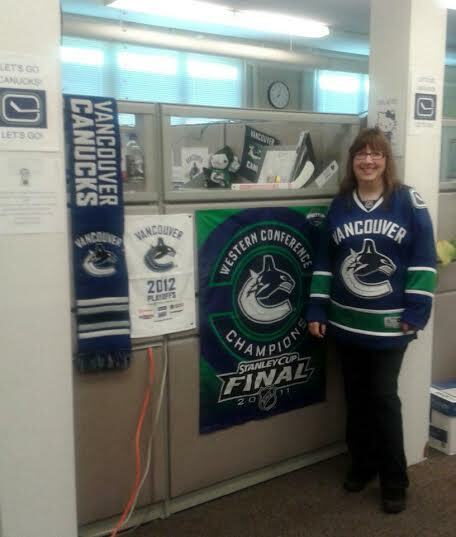 I have a small Canucks display in my cubicle at work, BUT when we make the Stanley Cup playoffs, I completely deck out my cubicle even more! 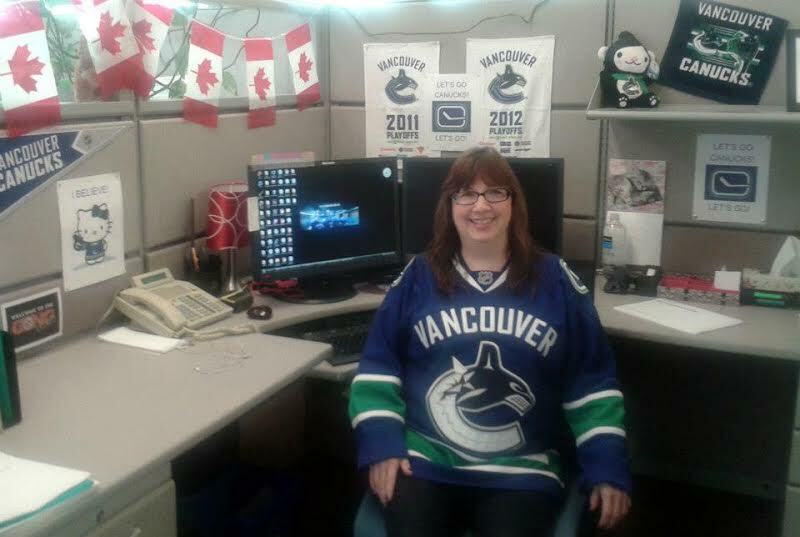 My co-workers know not to talk smack about the Canucks as I will ALWAYS vigorously defend my boys in blue! Scrappy players usually end up being players with the most heart and will always step up for their teammates whenever needed. That 2011 playoff run was absolute magic and to see how fans came together was something that I will never ever forget…I’m looking forward to another magical run in the future! No matter what happens in the new season, we are in for an intriguing 82-game journey! I am looking forward to seeing how the new guys mesh with the current ones and seeing Desjardins make his NHL coaching debut! Special thank-you to BOTH, Josh and Terry for participating in my True Blue series and sharing their stories with me and with all of you! As we inch closer to the new season, keep your eyes posted for MORE True Blue stories to come! As always, until next time, nuck said. TRUE BLUE: S.E.L. or Simply ME. This summer at Nucksaid, I decided to make it all about the fans, by putting the spotlight on all of YOU, and allowing you, the fans to tell YOUR stories! I have been asking to hear about your Canuck stories, and you have been more than kind sharing them with me! It seems only fair that I also include my own story in the mix, right? Right…so now you will hear my Canucks story! Are you ready for the tables to be turned on me? Here we go…! My love for the Vancouver Canucks and hockey itself came over me very slowly and then suddenly all at once. It was not that I ever disliked the sport, it just never was something that truly caught my eye when I was younger aside from watching hockey in the Olympics and the odd game, here or there. I was too young to appreciate or fully understand the magic that was the 1994 Stanley Cup run. It was not until high school that I really started paying attention to this team called the Canucks and learning all the I could about the game. My neighbours LOVED the team and always invited us over to watch the games…and slowly I started to notice feeling a gravitational pull towards this game and this team. I cannot remember the exact game but it was one the featured a snazzy play by Nazzy and some early Sedinery with Anson Carter in the 2005-2006 season that sealed my fate and captured my heart as a True Blue Canucks fan and there was NO turning back. Did they make the playoffs that year? No, but it was the off-season that brought change and re-ignited the team with hope with the hiring of Alain Vigneault and acquiring of Roberto Luongo. The 2006-2007 season that followed grew my love for the team and that goalie, Roberto Luongo who played a Vezina worthy year stole my heart completely for this game. A goalie sets the tone for the game, and LU came out with absolute determination that gave the team a chance to win every night. That was the season I decided to go all in with my non-wavering support for the this team. The team surprised a lot of people that season and gave us a thrilling ride all the way through two playoff rounds…including an epic game seven win sealed with a series winning goal from Trevor Linden. Every year since then my love for the game and the Canucks has grown exponentially. I may have turned into one of those fans who can quote stats forwards and backwards and possibly yells at the TV like the team and the refs can hear me for each good/bad call made or when that big goal is scored…but like I said, there is NO turning back. The Canucks are my team and I will always stand by them through thick and thin from game 1 all the way to game 82 and any games that go beyond. Do I have an all-time favourite player? More like MANY favourites because it is way too difficult to just choose one. My favourite former Canucks include Markus Naslund, Trevor Linden, and Roberto Luongo, all of whom were the epitome of class acts both on and off the ice during their playing tenures with the Vancouver Canucks. As for current Canucks my favourites would be Alex Burrows, Kevin Bieksa and Zack Kassian. I’ve been watching Burrows and Bieksa play together since their time with the Manitoba Moose to now and I absolutely love their tenacity on the ice. I love that Burrows came in undrafted and unwilling to give up on his dream and always capable of a BIG moment when least expected. Bieksa in his own words is a Canuck through and through…his loyalty to his teammates, his chirping and his insanely timed goals are beyond valuable. Kassian every year shows more and more determination and dedication to his game and is always willing to stand up for his teammates. Do I have an all-time favourite Canucks moment? Much like having more than one favourite Canucks player…I have MANY favourite Canucks moments. Luongo’s TWO shutout streaks (November 2008, November 2009), being in the arena LIVE for games (nothing compares to seeing your favourite team get a WIN on home ice!, Burrow’s back to back hat tricks (2010), Burrows playing with the Sedins, Bieksa’s SAVE & GOAL vs. Colorado (2012), Daniel’s last second goal against Detroit (2012) OR his between the legs goal vs. Calgary (2010), Hank’s 112 points (2009-2010), Lu’s 72 saves vs. Dallas (2007) or his SCF game 5 shutout (2011), Hank’s penalty shot goal (March 14, 2012) that had the arena on their feet, Hank’s 1000th game (2014) or THE goal off the Stanchion courtesy of JUICE (2011) that sent the Canucks to the Finals…BUT tops on this list IS Alex Burrows slaying the dragon in OT vs. Chicago (2011)…it felt as though you could hear the cheers from Canucks fans everyone when that puck crossed the line…THAT moment was absolute MAGIC. I look forward to adding many more favourites to this list as the years go by. One other moment that will always stand near that moment against the hawks, will be the moment that Roberto Luongo was Olympic GOLD on home ice at Rogers Arena…a moment that NO ONE, no matter how hard they try can ever take away from him. 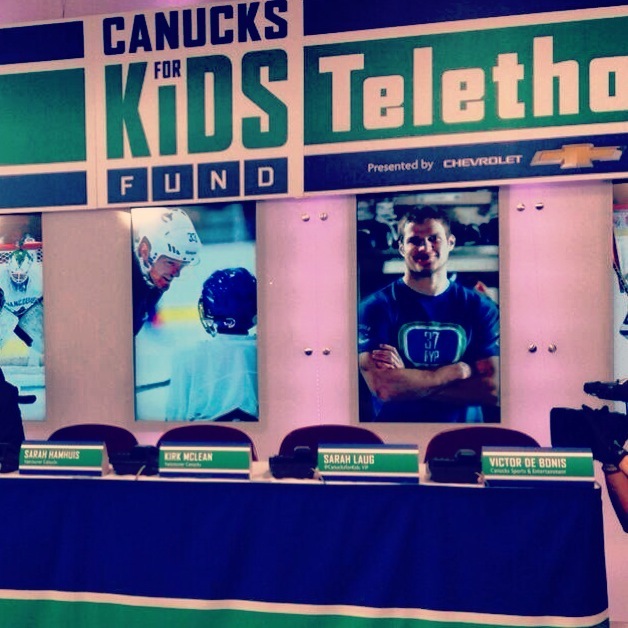 My personal most recent favourite Canucks memory is when I won a twitter contest and got to be a part of the 2014 Canucks For Kids Fund panel….and YES if you look close you will see that plaque next to my name….YES I sat next to Captain Kirk during the telethon! It was an epic experience!! I love every little thing about this crazy game called hockey….every up and every down, every goal, every save, every rush down the ice, every face off, every epic playoff run, every magic overtime moment, every game tying goal…everything. I love everything about hockey, EXCEPT for that dreaded little one-on-one contest they call a shootout that follows an unsolved overtime period during the regular season. I despise shootouts…they ruin the team component of the game and turn a wonderful up tempo end to end game into a one-on-one skills contest that sometimes costs the better team on the ice the game because as we all know…the shootout is not every team’s forte. The only other thing that irritates me to NO end in hockey is when journalists try to influence how fans think about their team and the game…it is okay for fans of all kinds to have differing opinions. I’ve already told you my favourite aspect of hockey (Canucks and non-Canucks related) is the FANS. I love the connection that is formed within fans of a team, fans of rival teams, and fans of the sport in general. I love discussing and debating this wonderful game with fans of all levels from all over the globe…there is always room to learn and share more about this great sport and about my Canucks. There is something very special about fans coming together whether it is in the arena cheering together, watching the game in a restaurant(pub or at home) or during an epic playoff run. When it comes to pre-game and game day rituals, I have a few. Nearly every game day will find me wearing one of my four jerseys(hoping to add another this season!) 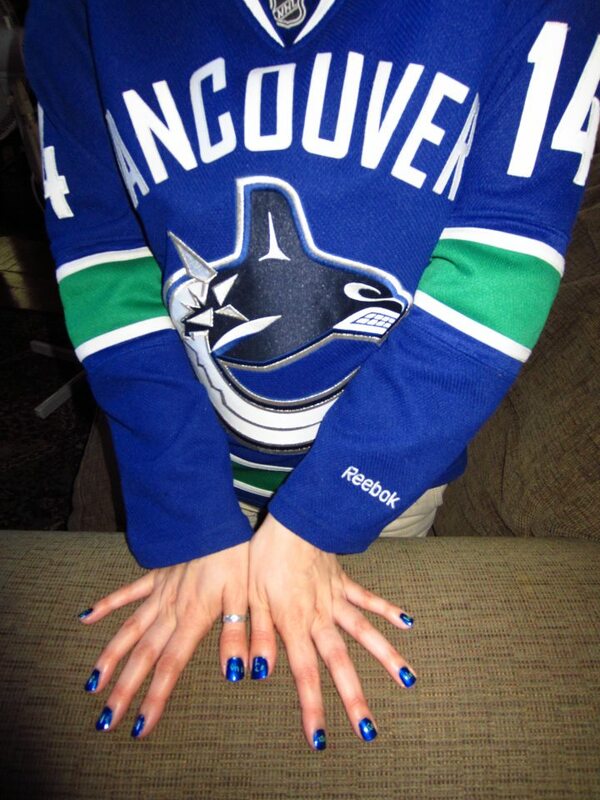 and during a playoff run as girly as it may sound..I paint my nails in Canucks themes. Every game day also usually involves making sure there are game approved snacks (chips+salsa,) on hand for when that big goal gets scored or even some victory/consolation ice cream. I am not lucky enough to have season tickets just yet but I would LOVE to be so lucky someday in the near future! I try to go to at least 3-5 games during the regular season….and if I’m lucky at least ONE playoff game when the team goes to the post-season. There is ONE game that I have gone to EVERY season starting in March 2008…the game that is ON or closest to my birthday that the Canucks play at home. It is one of my most favourite birthday traditions that I have with my family all Canucked out in our jerseys cheering for the team at the arena. 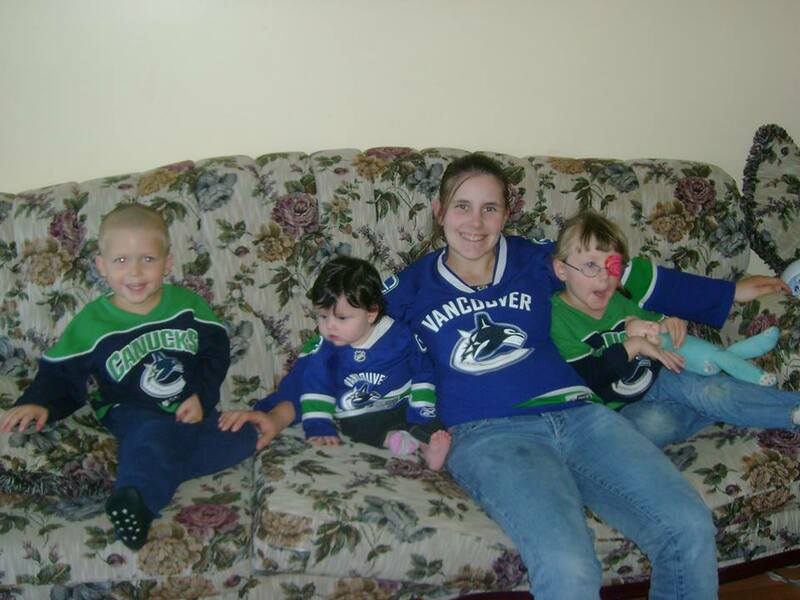 Yes, it’s true, I’ve converted an entire house that once held no hockey fans, all into diehard Vancouver Canucks fans. How do I feel about the upcoming 2014-2015 season? Last season after January, it was hard to watch the team at times as things began to fall apart and it became inevitable that changes were going to be made. It felt like a black cloud began following the team and storms followed as the season broke down. Bringing Trevor Linden back to the Vancouver Canucks was an absolute breath of fresh air after the last few years with Mike Gillis. Linden came in promising to make changes and promising that he would keep the fans in the know and he has done exactly that. With Linden came GM Jim Benning and newly minted NHL head coach, Willie Desjardins to help usher in this new era in Vancouver Canucks history. The newly formed brain trust has been hard at work taking care of business (the Kesler trade, developing the prospects, the Miller & Vrbata signings!) as they prepare for the upcoming 2014-2015 regular season. There is a LOT of potential with team Lindenning and players coach Desjardins at the helm moving forward with the team. I am looking forward to whatever comes next and while the season may be far from perfection…it will be worth watching the entire journey from start to finish no matter the outcome. Mostly, I am excited to share this upcoming season with ALL of you, whether you are a Canucks fan, rival fan or simply just a hockey fan…as we are in for a wild ride league wide! I am now, always have been and always will be a true blue bona-fide canucklehead and there will be NO changing of my ways. As always, until next time, nuck said. One last photo, one of my favourites featuring my dear beloved canucklehead Bailey, who spent more than 13 years being the best companion. I will miss you always my dear, sweet little Bailey. (December 8, 2000 – July 27, 2014). The summer about Canucks fans continues at Nucksaid as I will continue to introduce you to Canucks fans until the eve of the Vancouver Canucks first 2014-2015 regular season game. What am I asking the fans for? 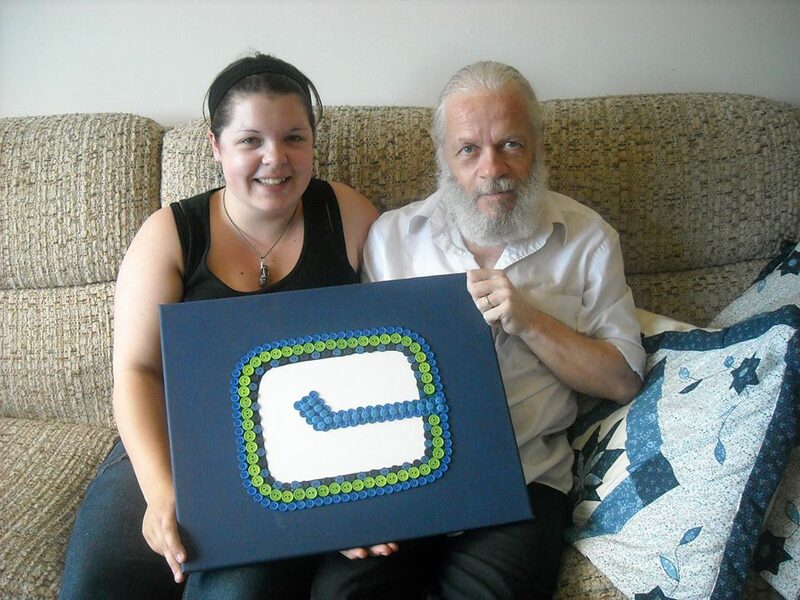 To simply share their Canucks story and to put the spotlight on YOU, the fans. Whether you have been a fan for your entire life or only a short period, whether you live in British Columbia or halfway across the world, if you’d like to be featured in my True Blue series simply send me an e-mail to nucksaid@gmail.com with the subject line: TRUE BLUE and I will send you the details! There’s always room for more stories! Now, are you ready for Round SIX of #TrueBlue? Here, we go! “When/how did I become a Canucks/hockey fan? I was raised in a household of Leafs fans. Regardless of what you thought, felt, enjoyed…you were a Leafs fan; no ifs, ands or buts. If you didn’t like the Leafs, too bad. You still displayed yourself as a Leafs fan. So in 1999, while watching the draft, I see these two geeky looking twins called the Sedins, who were drafted to the Canucks. I had already heard so much about them and all the wheeling and dealing it took to get them and thought to myself that these two are going to be really interesting to follow. So, on October 5, 2000, at the age of 14, obviously my parents weren’t about to let me stay up until 1:00 AM watching hockey games, so I began setting my VCR to record the CBC aired games of the team they were drafted to, the Canucks. Thus, began my love affair. What drew me to the Canucks as my team, living outside of British Columbia? It began with the hype around the Sedin twins, but the more games I watch, the more I saw the team as up-and-comers. They certainly weren’t the best team in the league back then, but there was so much passion and skill that I could just feel that the boys on the ice were destined to be top competitors in the coming years, and I just couldn’t take my eyes off of them. It was unfortunate that the only games I was able to watch were ones aired on CBC, as I live in Ontario, but I would follow them as best I could. If it meant watching the highlights the morning on TSN or going to the library to check out the stats from the previous nights’ game, I did it. There was no stopping my run from the Leafs into the rink of the Canucks. My love affair just continued to grow. Well, I can only answer from 2000 and beyond, but again, I would have to go with the Sedins, if I can pick both. The talent and skill, the TWINTUITION that those two have together on the ice makes for some beautiful, envious and dangerous plays. Off the ice, these two are extremely generous, giving not just their time back to the community, but money to help support research and care for sick children. They never fail to amaze me. My puck bunny answer would be Ryan Kesler…but then who doesn’t love him? What is my all-time favourite Canucks moment? How do you choose just one? There are just SO many….BUT if I have to pick, it’s definitely a tie between Alex Burrows’ OT goal in Game 7 that eliminated the Chicago Blackhawks and sent us into round two of the playoffs. The energy from the night was so high, you would have thought we had just won it all. The other goal was Cody Hodgson’s beauty of a PING against Tim Thomas in our first game post-Cup Final loss against the Bruins. Rookie vs. Veteran…and he didn’t even see it. Absolute beauty. What is my favourite and my least favourite part of hockey? Hockey makes my adrenaline rush. When the boys rush the crease and desperately attack the puck for a goal with seconds left to play, my heart starts pounding, and I’m at the edge of my seat and when that goal goes through…the excitement gives such a high. It’s exciting, it’s breathtaking. I love the fast pace, the fights, the action. What is there NOT to love? Well, to answer that last one, I’d say my least favourite part, BESIDES Gary Bettman himself, is the shootouts. I DESPISE the shootouts. If after 65 great minutes of hockey, the game ends in a tie, it ought to stay in a tie. Both teams fought hard to split the points and hockey is a TEAM effort. I don’t believe a team should be awarded an extra point based on one player vs. the goalie being on the ice and scoring a goal. Do I have any game day/pre-game rituals? Doritos and coke. A bag of Sweet Chili Heat Doritos, and a tall glass of Coca Cola with three ice cubes. That’s it, that’s all. How do I feel about the upcoming 2014-2015 season? Brandi, I am the same way…it is way too hard for me to choose ONLY one favourite Canucks moment, I love the Sedins TWINTUITION every night and I could not agree more about the dreaded shoot out! 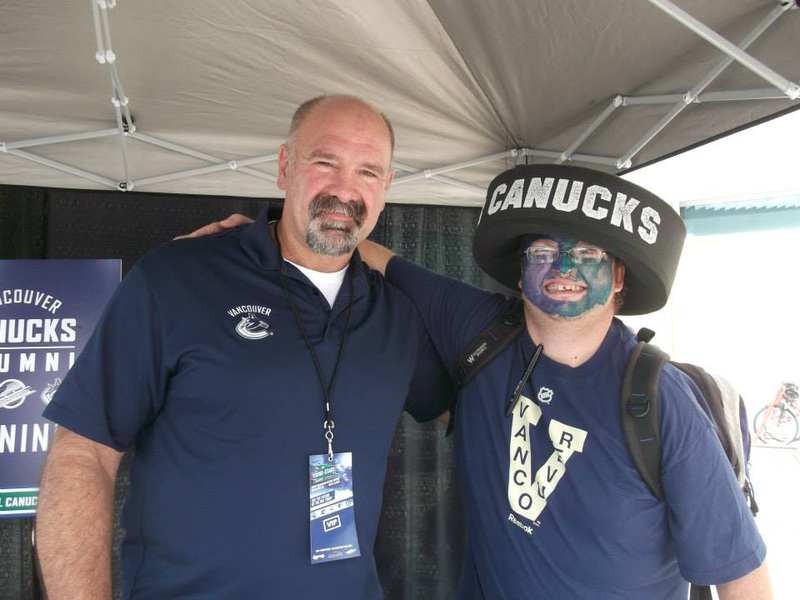 Next up please meet David McPherson, pictured below with Canucks alum, Dave Babych (picture provided by David). “I have been a Vancouver Canucks fan for as long as I can remember BUT I guess it goes back to my very first NHL game which was in the 1991-1992 season. The San Jose Sharks very first NHL game and have followed them ever since and with living on Vancouver Island and in the Okanagan, have followed the Canucks ever since. I’ve been lucky enough to have been to a few games over the years as well. My all-time favourite Canuck would have to be Pavel Bure. Growing up as Canucks fan during the Bure era, he was AMAZING. I loved his speed, determination and ability to score goals. My all-time favourite Vancouver Canucks moments would definitely have to be the 1994 and the 2011 Stanley Cup playoff runs. My least favourite part of hockey is the season ends and the off-season begins. My favourite of hockey is the entire season when hockey is on. 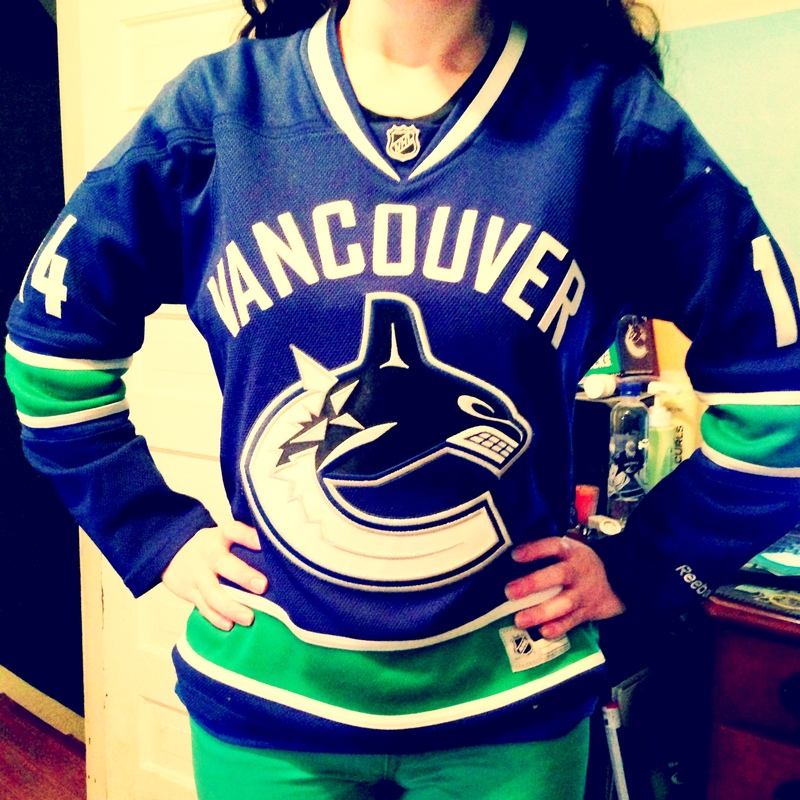 My pre-game rituals is usually wearing my jersey and Canucks shirt. During their playoff runs OR when the Young Stars tournament is on here, I wear my puck head around town. David, there is nothing quite like the thrill of seeing your team go on a great playoff run and seeing the fans come together the further the team goes! I think Ryan Miller just might surprise a lot of people this year and hopefully a few young prospects will break into the lineup throughout the season. Special thank-you to BOTH, Brandi and David for sharing their Canuck stories! I love all of the unique stories that each one of you has shared with me & I am looking forward to sharing them with all of you as we continue the countdown to the new season in October! This summer at Nucksaid, I decided to do something a little different on the blog, in counting down to the Vancouver Canucks 2014-2015 regular season! THIS summer I will introduce you, to my favourite part of the Vancouver Canucks: THE FANS! What am I asking YOU, the fans for? Simply to share your Canucks story and what makes YOU a Canucks fan through and through. If this sounds like something you would like to be a part of, simply send me an e-mail to nucksaid@gmail.com with the subject line: TRUE BLUE and I will send you the details. I will be featuring True Blue profiles all way up until to the first game of the 2014-2015 regular season, so there is plenty of room for as many fans as would like to participate! Every post will feature TWO profiles. Are you ready to meet two more True Blue participants? Here, we go! Let me introduce you to, Jason Allen from Perth, Australia! 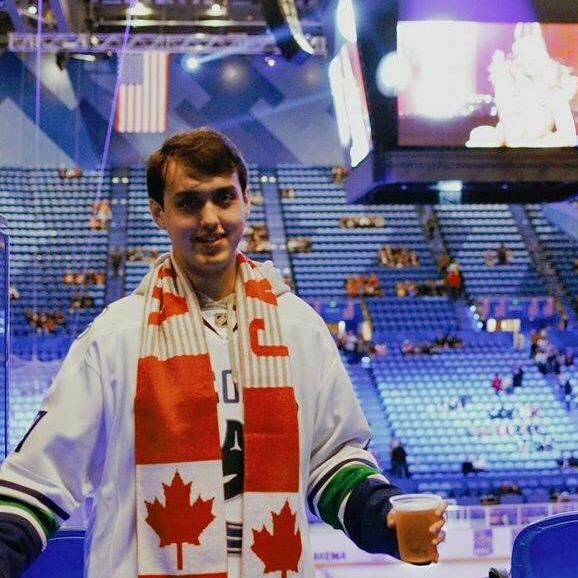 Pictured below in his Canucks gear at a recent CAN/USA ice hockey game in Perth! (Picture provided by Jason). “When/how did you become a Canucks/hockey fan? If you live outside of British Columbia, what drew you to the Canucks as your team? I started getting into hockey during the start of the 2009/2010 season; living in Perth, Australia the sport is currently in a small market, but it’s definitely growing at an extremely fast rate! Like many Australians, their first contact with Ice Hockey came about through ‘The Mighty Ducks’ movies, I was no different (I believe even Australia’s own Nathan Walker started his journey after watching the movies! ); after watching that I wanted to get into the game, but at that moment in time there was no way to watch games live available to me, so I just watched video upon video of highlights and really just got my fill through reading up on the history of the sport. But during the 2009/2010 season a number of live NHL games were shown live on national television every week, since then I’ve been absolutely hooked to the sport. Nothing specifically hockey related drew me to the Canucks, not surprising at all since I knew nothing of the sport at the time… But I’ve always had a love for Canada and more specifically Vancouver ever since I was little; so it was came more as a “why wouldn’t I support them?” than anything else. Fingers crossed I can head over to Vancouver to see its beauty first hand and catch a live game/s over the next few years. I can’t go past players who gave absolutely everything for the team; dedication, perseverance and effort over just skill any day! So with that being said, Rick Rypien has to top the list for me. During that first season of me watching hockey, his enthusiasm never failed to make me happy, to see him punch above his weight and thrive doing so was a joy to watch. Soon after, I purchased a Canucks jersey with his name on the back; it is still to this day my favourite hockey attire and I’m sure it’ll stay that way for many more years to come. “Finally, after 3 seasons, and 19 playoff games against Chicago, for Vancouver, it’s a wonderful day for an exorcism”. Burrows. Blackhawks. Need I say more?! Two things stand out as my favourite parts of hockey; first would be the intensity of the game, no other sport in the world can compete with a Stanley Cup playoff game. Second of all, it’s the connection and togetherness of fellow fans through social media; I’ve had the privilege of coming into contact with some pretty amazing people through twitter and I really do hope that continues! Excited and optimistic. The selection of Desjardins and Benning along with the earlier appointment of Linden definitely fills me with confidence as to what the future holds for this franchise. Quietly still dreaming of a Stanley Cup in the near future, but it’ll be an interesting and fun rollercoaster ride we’re in for regardless! No Jason, you need not say more…that moment will ALWAYS be one of my all-time favourites. No contest. Here’s to seeing some more dragon slaying moments in the near future! Go Canucks Go! Next up, please meet Beck Mitchell…who is also from OZ! (Picture provided by Beck). 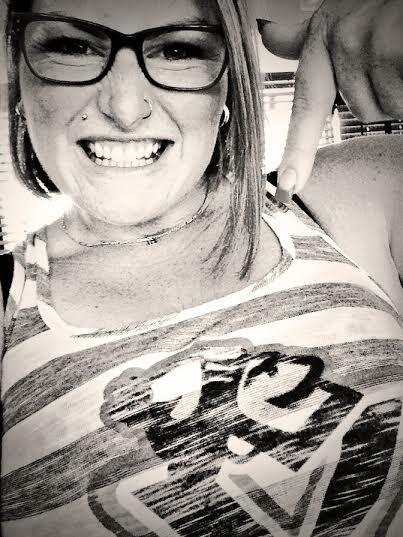 “Hi, I’m Bec, and the 2013/2014 season was my first ever hockey season. Being from Australia, Ice Hockey is not really a mainstream sport. The only ice hockey I had seen was The Mighty Ducks movies in the school holidays. I randomly went to a local hockey game at the Icehouse in Melbourne and fell in love with the sport. I started researching the NHL and decided to pick a team, not knowing anything about Canada or the teams I decided to choose a team that reminded me of my Australian Rules Football team and this was the Vancouver Canucks. I ordered NHL Game Center and I was hooked. Not knowing anyone else that liked hockey in Australia, I joined Twitter and started chatting to fans. I have met some of the most amazing people this way and all have been very helpful teaching me the ins and outs of being a True Blue Canuck, I could not have hoped to pick a better team with a nicer fan base. My favourite Canuck player at the moment is Zack Kassian; he is fast and hard hitting I like that. My best memories have been sitting on the beach on my summer holidays watching the games live on my iPad while soaking up the sun and cheering online with people all over the world. I even drove 5 hours this past Christmas to meet a fellow Canuck fan who was over in Australia for a holiday. We are now lifelong friends, she has recently moved here and I was bridesmaid at her wedding. Us Canucks fans, really are like one big family. My favourite part of hockey is the speed and skill in the game, its very thrilling to watch and games are always full of excitement. My least favourite part is that being in Australia you are so far from the action of the NHL, although I have recently started following The Melbourne Mustangs which is a team in the 8 team National AIHL. I have found a whole new group of Ice Hockey friends Australia wide. I try to watch every Canucks game, whether I be on holidays or dragging myself out of bed for the New York games at 5AM! I am known where I live as the crazy Canuck ice hockey fan and I love it. I have bought loads of merchandise from Canada and wear it with pride all year round. I am always getting asked about my team and trying to convert as many Aussies into fans as I can. The Vancouver Canucks have me so hooked that I am even heading to Canada in the 2015/16 season just to see a game at Rogers Arena! A crazy solo hockey trip for a crazy Canuck, just to see the team I love but I’m sure it will be worth every dollar and the 18 hours on the plane to see it. I am so excited about the upcoming season. The team has made plenty of changes and it will be completely different season! It will be interesting to see how the new management and coaches run the boys and I’m hoping to see the Canucks in the playoffs. I want to say a big thanks to the whole Canucks fan base for being so nice to me and I look forward to cheering on the boys next season with you all. Sometimes, twitter really is amazing…I love you have made some incredible connections through your love of the game! I promise you, that when you finally do come to see a LIVE Canucks game…you will not regret it! A game at the arena, cheering with 18,000+ fans is an experience like no other. Special thanks to BOTH, Jason and Beck for sharing their TRUE BLUE stories! I look forward to cheering on the team with you and all of Canucks nation when the season begins in October! There are more stories to come from fans around the world as the summer continues we count down the days until the NHL returns! Stay tuned! What am I asking YOU, the fans for? Simply to share your Canucks story and what makes YOU a Canucks fan through and through. If this sounds like something you would like to be a part of, simply send me an e-mail to nucksaid@gmail.com with the subject line: TRUE BLUE and I will send you the details. I will be featuring True Blue profiles all way up until to the first game of the 2014-2015 regular season, so there is plenty of room for as many fans as would like to participate! Shall we, meet some more TRUE BLUE, Canucks fans? Yes? Yes. Let me introduce you to, Justin Lai who last season, was the lucky winner of the Rogers Arena/Canucks 25th Million Fan Twitter Contest!! He described the moment as the following: “What a magical night experiencing the hockey game, being interviewed during the intermission, and getting to go onto the ice and receiving a game worn autographed jersey by one of the Canucks.I ended up with Daniel’s jersey!” Admit it, who else is jealous of that moment? (Picture provided by Justin). “I’m currently 26 years old, a business graduate, a diehard Canucks fan and my passions include Marketing, Social Media, and of course the Canucks. I have been following the Canucks for as long as I can remember and I am excited to recently land a job with them this Summer. During my free time, I also volunteer for the Canucks For Kids Fund and I always love to talk about hockey and the Canucks with people. 1)When/how did you become a Canucks/hockey fan? If you live outiside of British Columbia, what drew you to the Canucks as your team? A: The Canucks came into existence in the NHL as an expansion team in 1970, but their history dates back to as early as 1945 and although I wasn’t born until 1988, for as long as I can remember, I have been a hockey fan. I remember playing ball hockey in my basement as a child and although I was too young to know what was going on with the Canucks in their early days, I remember being a part of the 1994 run as an excited young six year old and my love for the Canucks has grown ever since. As I grew up, I learned about the early history of the Canucks and have supported them. I grew up and there was nothing else I wanted to be more than a professional hockey player and dreamed that one day I would play for the Canucks and score THE goal that would them their first Stanley Cup. I know it’s not realistic when I look at it today, but I was a young child back then who didn’t know better other than my passion for the Canucks and hockey. From the days of the 1994 cup run where heroes such as Pavel Bure, Kirk McLean and Trevor Linden were some of my favourite players to the days of the West Coast Express including Markus Naslund to today where Daniel and Henrik Sedin, Ryan Kesler, Alex Burros, Rick Rypien, and Roberto Luongo are some of my favourite players in hockey. I have always had a deep love for the game of hockey and have supported the Canucks for as long as I can remember. 2) Who is your all-time favourite Canuck (current/retired/no longer a Canuck) and why? This is a tough question considering I love the Canucks so much that it is hard to choose one of each but ill tell you one from each category. Currently I would say, the Sedins are some of my favourite Canucks. They are such nice down to earth guys and always play with class. Their community work and compassion is also a major reason why I like them so much because it’s not always about the goals and assists but also about what kind of people you are off the ice representing the team and the Canucks led by the Sedins do a great job of this. For retired and past Canucks it’s quite simple. Trevor Linden. He embodied everything that was a Canuck. He played hard, gave it all he had every night and also earned the respect of everyone by being a classy guy who played the game with heart. He might not have had the most points in franchise history but again it’s not necessarily the stats that matter the most. His leadership and personality is one that truly defines what being a Canuck is all about and in my eyes he always will be Captain Canuck. 3) What is your all-time favourite Canucks moment? My all time favourite Canucks moment would have to be in 1994 and the entire run by the underdog Canucks team lead by leaders like Linden, Mclean and Bure. Their run ultimately fell short but it captured the heart of Vancouver and was truly a ride to be a part of. Everything from comebacks to overtime goals to a city rallying behind the team on such a passionate level that’s what sticks through the most to me and made me love the team I grew up with. 4) What is your favourite and your least favourite part of hockey? Favorite part of hockey is how the love of the game can really bring people together. Least favourite part of hockey is that it’s not all year round! 5) Do you have any game day/pre-game rituals? Whether it’s game day or not, it’s rare that you will find me without any sort of Canucks gear on. That’s just one way that I am, so passionate about the team and the game of hockey. I don’t believe in superstition, but I usually like to wear one of my jerseys or Canucks shirts on game days just to proudly display my Canucks colours around town. 6) How do you feel about the 2014-2015 season? 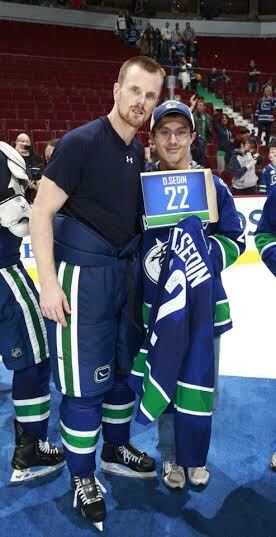 First, WOW getting to meet Daniel Sedin on the ice after the game and getting his jersey!! Lucky! That will be a memory you’ll never forget! Second, I could not agree more about supporting the team through the good, the bad and everything in between because anything can happen and one day they will win it all. Next up, I introduce to you, Charlene Fairchild (picture provided by Charlene). “Ahhh hockey! I was born in Nova Scotia, birthplace of Hockey (Windsor, Nova Scotia http://www.birthplaceofhockey.com/), and grew up in a hockey home. My Dad was a passionate Leafs fan, back in the day of the Original Six. He told stories of growing up poor in the Depression but, I most loved the story he told about using horse droppings as hockey pucks! Every Saturday night was really Hockey Night In Canada, eagerly anticipated all week. The whole family gathered for the game and bedtimes were suspended. My brothers played lots & lots & lots of street hockey. I owe my love for the game to my Dad. He taught what being a true fan was all about. His knowledge of and passion for the game helped lay the foundations of my continuing obsession with the Greatest Game On Earth! (Sorry, not sorry, socceroos!) Eventually my Leafs fan Dad became a season ticket holder with the Halifax Moosehead of the QMJHL. So, what’s an east coast gal doing being a passionate True Blue Canucks fan? I grew up, married, moved away. My hockey days were pretty random & spotty during those years as the men I married were neither of them sports fans. Eventually I moved to the Columbia Valley at the confluence of the Kickinghorse and Columbia Rivers in Golden…BUT it wasn’t until the 2010 Olympics that I awoke again to hockey. I’ve always been a goalie afficionada and one goalie caught my eye and my heart…”Bingo Bango Bongo, his name is Roberto Luongo.” I was hooked. And he was a Vancouver Canuck. So I started watching Canucks games and thereby fell in love with the whole team hook, line and sinker! That love for the team has only grown stronger and stronger.
) as Social Media person for the team the Golden Rockets. I live tweet the games as part of our broadcast crew. You mean I have to choose? Out of the past, from all I have learned and watched, that would have to be Pavel Bure & Gino Odjick. Presently, Eddie Lack and Kevin Bieksa. That would have to be the 2011 Stanley Cup run. My favourite and least favourite part of hockey? When I walk into the arena and the boys go out on the ice…I love the slice of the blades on ice, the cold, the anticipation. I love the sound of the goal horn, the fans cheering and chanting, AND I love the play on the ice. Watching the young guys make their plays, defend their zones, and celebrate a goal! I love everything about hockey except shootouts. Charlene, I’m with you, goalies have always had a way of stealing my heart. Roberto Luongo’s determination and will to win when he was a Canuck, propelled me into the Canucks fan that I am now. I am also 100 % with you that shootouts are my LEAST favourite part of the game! Special thank-you to BOTH, Justin and Charlene for sharing your stories! I LOVE all these stories that everyone is sharing with me AND sharing them with all of you! I look forward to sharing more fan stories with you as the summer continues! Are you ready to meet some more amazing Canucks fans? 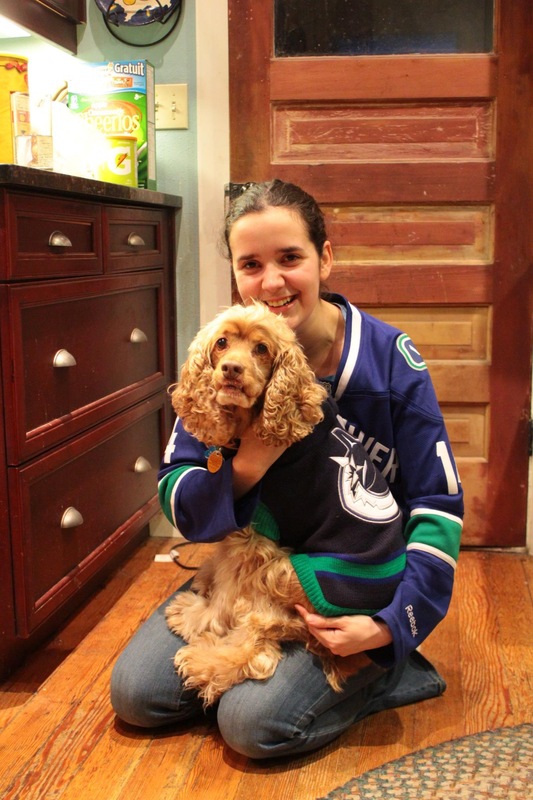 Meet Canucks fan, Brieann Knorr…how many Canucks can you spy in the background? (Picture provided by Brieann). 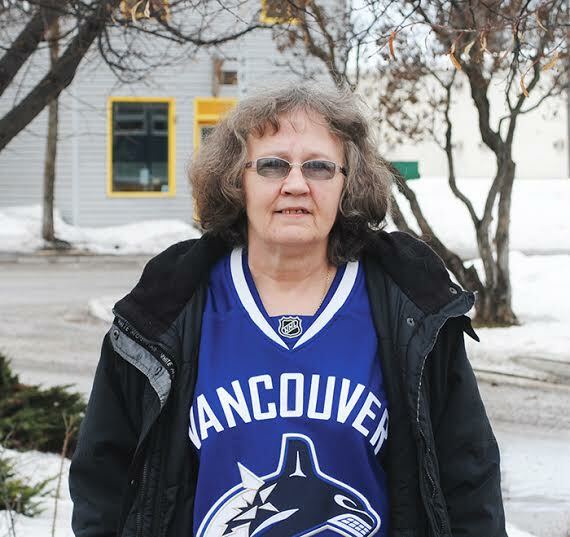 “I became a Vancouver Canucks fan in 2003, after my Dad and I had been watching hockey for years. I got my first Canucks jersey for my eighth birthday and have been a fan ever since. I have 2 all-time favorite Canucks. The first would have to be Markus Naslund as he was my favorite player growing up. I was still a little young when he was playing but I remember he was such an awesome player and a great person. I got the chance to meet him and it was incredible. I almost cried when he retired because he deserved everything, he is such a humble guy. My second favorite has to be Henrik Sedin!! He is the most humble player the Canucks have ever had. I like his humbleness and how dedicated he is to the team, players and the fans. He is one of my role models. My favorite all time Canucks moment has to be the 2011 Cup Run. I had never been on a Cup run and it was the best and worst moments as a Canucks fan! I have never seen a city more united around a team. I have never been more passionate for the team and I can only imagine what winning the Cup will be like. I love that hockey unites people! That we all cheer for the same team and can talk about it together BUT I don’t like the hate that players get from the fans. I consider myself to be a semi superstitious fan…I tend to think I can control what happens on the ice even though I know its impossible. I don’t like watching games because I think I could make them lose. Markus Naslund was the epitome of a class act both on and off the ice, and seeing his jersey go up to the rafters joining Smyl and Linden was amazing to witness. The 2011 playoff run was an absolutely unreal time to be a Vancouver Canucks fan! Everywhere you turned, there were people representing the Canucks, blue and green took over local businesses and you could sense something special was happening. I’m excited for the next great playoff run that will take the province and Canucks fans around the world by storm! Next up, I’d like to introduce you to Tony Maguire displaying a beautifully made button picture that his daughter, Katie made for his birthday! (Picture provided by Tony). “My Canuck story starts the same year as the Canucks. Being a fan of the Ballet on Ice I’m not sure what drew me to the Canucks. The early years were difficult but through all the abuse of other hockey folks and the roller coaster rides that were the first few seasons, I still remained loyal and true. I guess what really sealed the deal for life for me was 1982 and our first cup run. I had been to many games but never had the excitement of watching the Canucks go so far and then into the finals. I got given a ticket and was sitting 3 rows behind the Canuck bench. The sights the sounds the smells of being a part of it will always be with me. From that point on it became my way of life as my wife and kids will attest to! I am one of those obsessed fans who has extensive Canuck wear and memorabilia that when we moved recently, packed 4 large plastic totes. 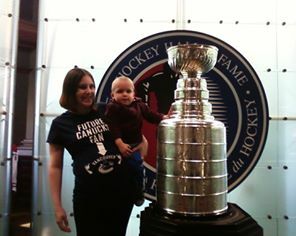 All my kids became Canuck fans and now the grand kids as well. 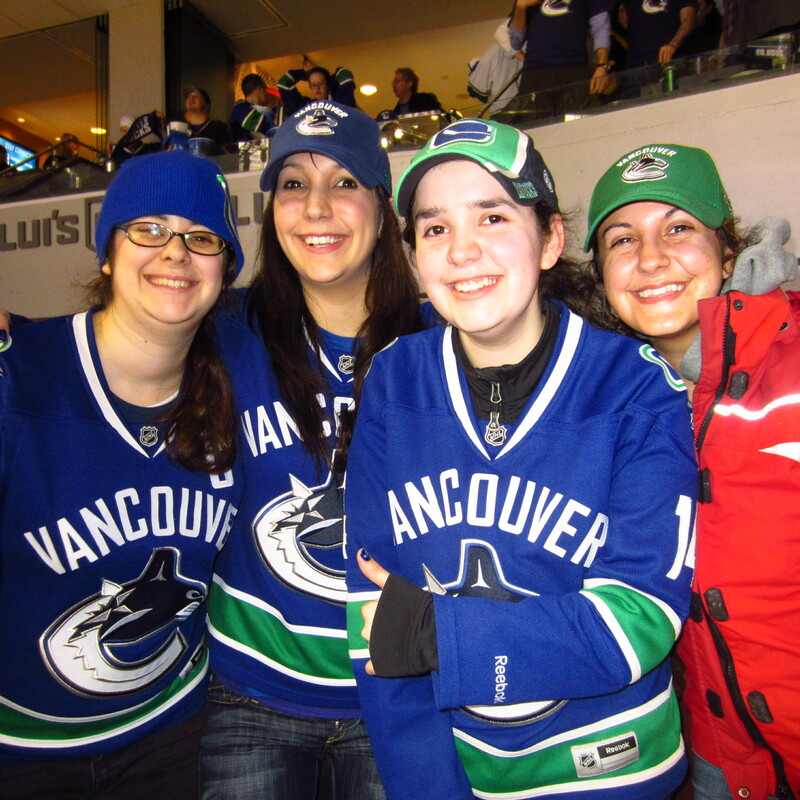 A good memory is going with 2 daughters to a Vancouver game in 2004 to see them play our rivals, the Calgary Flames. The day before we were in the Cactus Club getting food when Trevor Letowski, Matt Cooke and Bryan Allen came in. We got to hang out with them, got jerseys signed and had the best lunch ever. Outside the arena we waited for the Team bus from Calgary to arrive. When former (still my favorite) Canuck, Matin Gelinas got off we cheered and he came over and around the barrier to chat with us and we got a great picture. Going to a Stanley Cup Final game and sitting so close to the team bench would be an absolutely amazing experience! The sights and sounds of a playoff game are so much more intense than a regular season game, the cheers and silence from the stands echo the pattern of the game on the ice. If you have never been to a playoff game, I suggest the next playoff run, you try to go…because there is something so special about being there live for a playoff victory and cheering with 18,000 + fans together. .
Special thank-you to BOTH, Brieann and Tony for sharing their TRUE BLUE stories! I hope you enjoyed reading them and are looking forward to the fan stories still to come this summer!